Cooler weather and spooky skeleton memes around every virtual corner can only mean one thing: autumn is here! Arguably the most anticipated holiday of the fall season, Halloween, imbues millions of festive souls with the desire to carve faces out of food, pass candy to strangers, and scare said strangers for laughs and giggles. One of the safer traditions for Halloween is bingeing horror movies, books, and television, though there’s no need to try and contain horror to just one time of the year. Burying your head in a good mystery is good for the soul in all seasons. 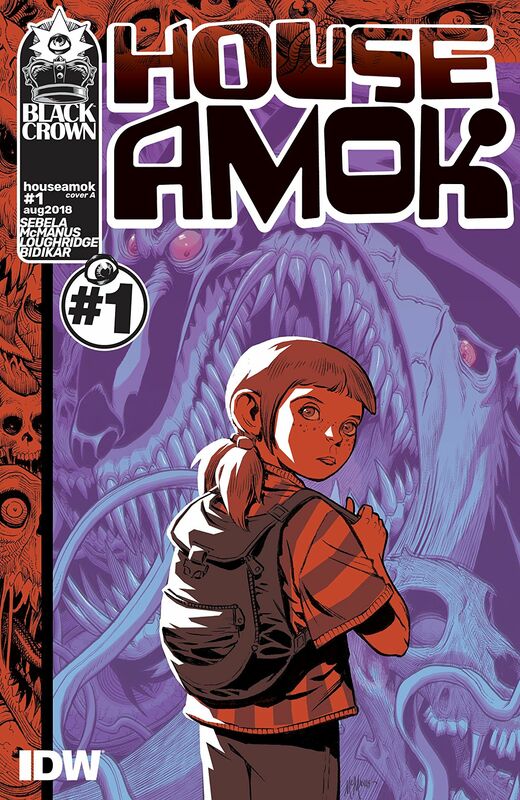 So even if you’re not in the pre-holiday spirit yet, allow me to hype you up with the new horror comic House Amok, written by Christopher Sebela with art by Shawn McManus and Lee Loughridge. Dylan Sandifer and her twin sister, Olivia, are part of a very close family with a heck of a lot of secrets. Their parents are huge into conspiracy theories and feel like they may be a part of one. For answers and all-out curiosity, the family goes to a tourist attraction called the Oregon Vortex and leaves with what they were looking for . . . kind of. Now they share one huge terrifying trip, and paranoia is regulating their every move. The introductory issue packs a lot of potential for a dynamite comic book series. Out of all the reasons to throw this in your pull list, here are the highlights. After jumping off the wild ride of issue #1, the last emotion I felt was a massive pile of pity for our sad little protag. It’s painfully obvious that the family bond means everything; it’s the one thing the Sandifers hold even dearer than conspiracy theories. Dylan’s tightly wound bond with Olivia is even stronger, calling her “family inside the family.” Even Tyler, their teenage brother, who is filled with typical angst and complaints, is knee deep in the chaos. Because of Sebela’s well-crafted leadup to a shocking reveal that happens in this installment, readers will already have a sense of the rest of the emotional turmoil she has yet to describe. We have seen a bit of how far her family has gone to either prove their theories or stay alive. As chilling as the situation is for poor Dylan and her family, part of the awesomeness to look forward to in future issues is the visuals. I’m hoping we’ve only scratched the surface of what team McManus and Loughridge is capable of producing for House Amok. The eerie images are greatly complemented by shades of orange and red to relay a sense of alarm and dread. 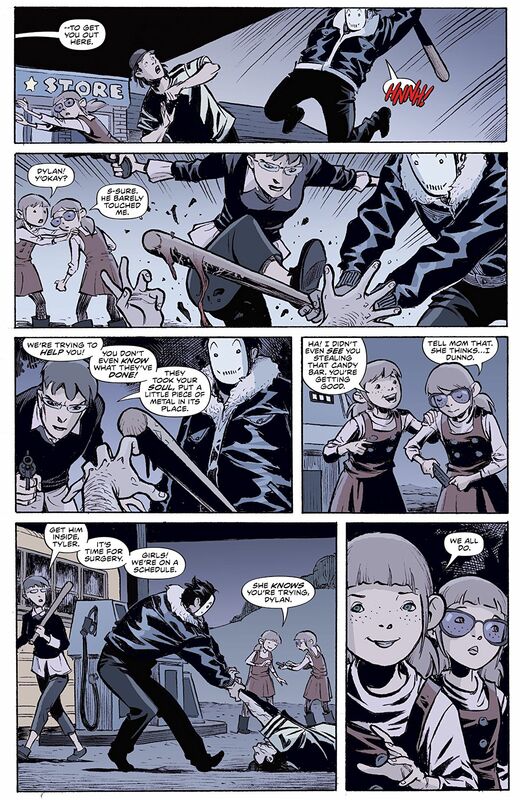 It contrasts the pale yellows and browns that fills most of the comic, which helps readers distinguish the Sandifers’ perspective from everyone else’s. House Amok #1 will leave you asking a few questions, but they are all the right ones for this early in the series. I truly do feel bad for the Sandifers; they’ve all experienced the one thing they’ve been preparing for, and they are leaving a trail of wreckage that will surely catch back up to them. It isn’t easy making time-hopping stories smooth to follow, but this issue is well paced enough for readers to keep track of the madness. Check it out—and if it leaves you craving answers, you can move on to issue #2, which hit the stands on October 3! Kristopher is a mental-health assistant with way too many hobbies. Among horror stories, comic books, and wrestling, comics have become her number-one fandom. She cohosts an all-girls comic club and also dabbles in PC gaming, playing ukulele, drawing, and rewatching old anime.